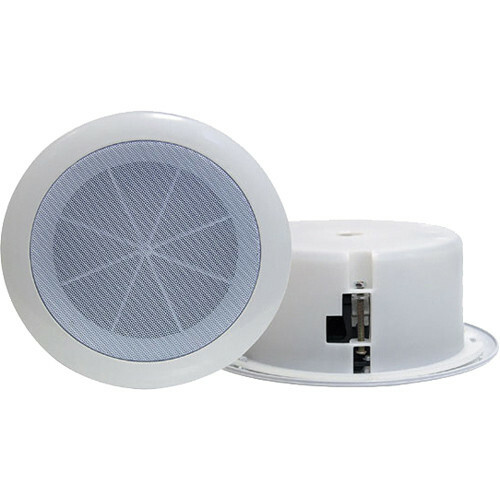 The PDICS6 from Pyle-Pro is a professional-quality in-ceiling speaker. It features an unobtrusive flush-mount design to provide high-quality audio without being visually distracting. The speaker has a 6.5" full-range driver with a 1" voice coil and a 1.5" tweeter cup to provide detailed audio with a wide frequency response. Box Dimensions (LxWxH) 9.3 x 9.3 x 4.1"
PDICS6 6.5" 120W In-Ceiling Speaker is rated 4.0 out of 5 by 4. Rated 3 out of 5 by Anonymous from Perfect for the price If you are trying to make a THX home theater, these are not the speakers for you. If you want light ambient music, they are perfect. I used 2 of these with a 40 watt amp Pyle PTAU23 2x40W MINI COMPUTER AMP w/USB for a 500 sq ft yoga studio. If you are expecting booming bass notes look elsewhere. This amp speaker combo with an iPod as the source produces more than ample quality and volume in the 500sq ft studio. Yoga not Dance studio... the volume requirements are much lower. Rated 4 out of 5 by SirJones from Good We have installed 12 of thes speaker to have music playing throughout the office. I have been satisfied with the sound of the speakers. They can handle loud very well and soft good. I pleased and that is hard to do. Easy to install and daisy chain. Good sound. I will buy them again. Rated 5 out of 5 by beatmaster from great product at a great price. fits perfectly and it was exactly what i was expecting, thank you! Can this be mounted in an 8 opening? Pyle recommends Cut-Out Dimensions: 6 &lt;a href= http://3/4https://www.turnto.com/tra3/images/submitbttn.png target= _blank &gt;3/4https://www.turnto.com/tra3/images/submitbttn.png&lt;/a&gt;'' Diameter x 3 1/2'' Depth.